I knew that my great-great-great grandmother was Itta Farkas Rutner, since her name was given on her son Shmuel Moshe Rutner's birth record. But that's all I knew--until now. As some of my relatives whom I've begged nicely asked to take DNA tests can attest, Israel Pickholtz of the All My Foreparents blog and author of the only book out there on Jewish DNA analysis has inspired me to leverage DNA testing to forward my only family's genealogy. 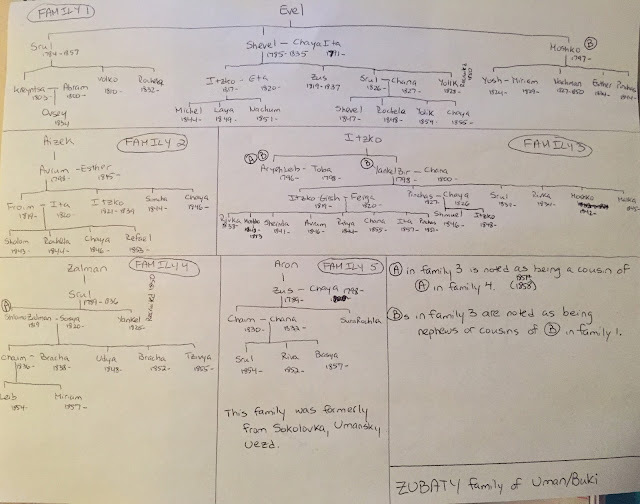 A few weeks ago, he published a post looking at the differences in the amounts of shared DNA expected and that seen between those with Jewish DNA; he also demonstrated how much siblings' matches can differ. I now am administering enough kits that I decided to do a similar analysis. I was recently contacted by Yahoo News who saw my post about how genealogy saved my life. They were planning a story on 23AndMe, which is back in the news now that they have been approved to give some health results, along with the genealogy results which they never stopped giving. I spent Veterans' Day with the crew and have learned that the Hollywood life is not for me; it was a long and exhausting day! But the resulting video is now released. I can't believe how 6 hours were distilled to this story. Last month, I discovered that two Sanshuck brothers, William (Velvel) and Isaac, left Krasnoye and came to America and changed their last name to Sincher. Their wives later joined them in Denver. 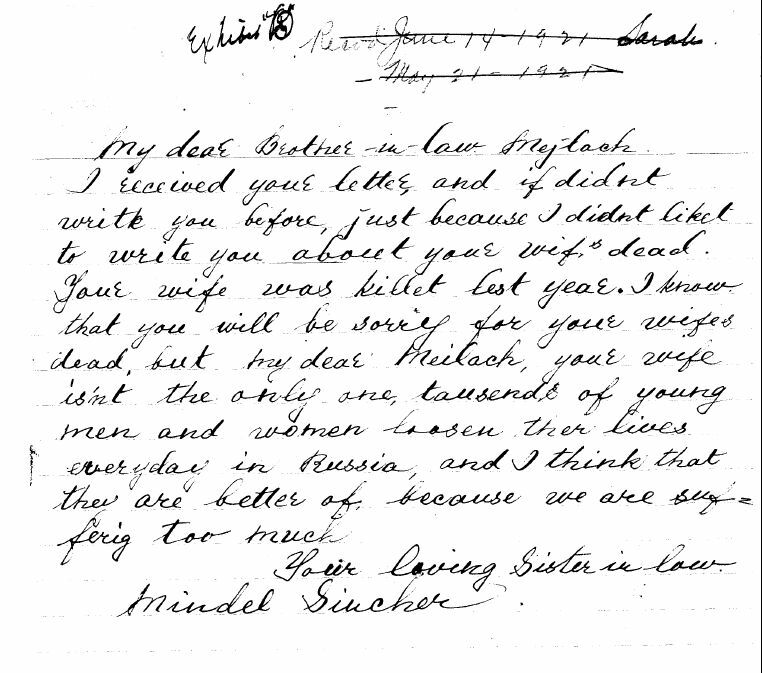 Looking into this family a bit more, I discovered there were actually four Sanshuck/Sincher brothers--the other two were David and Morris (Meilach). 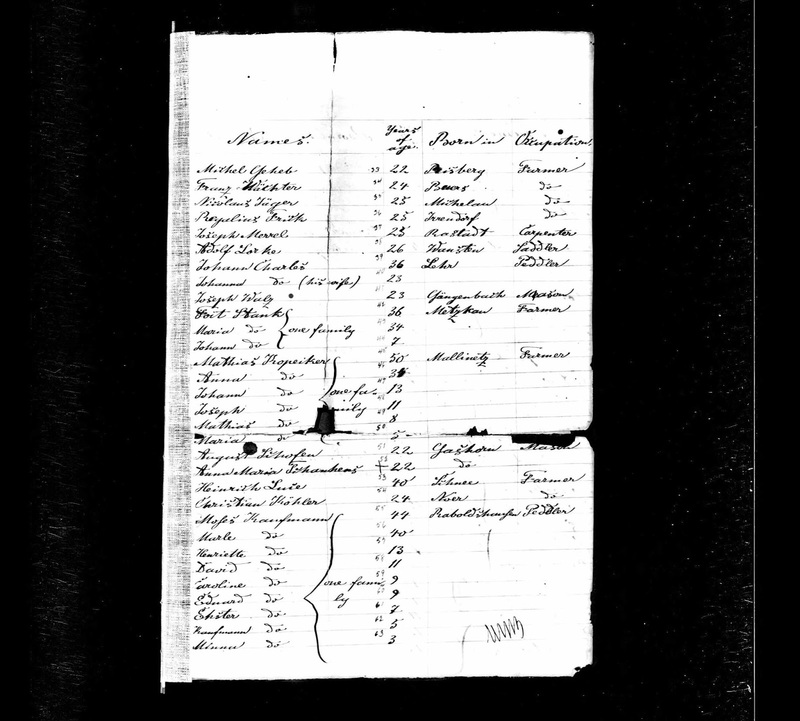 When the brothers first immigrated, they were living in Laramie County (perhaps in my honor? ), Wyoming--and were homesteading. This must have been quite a change from their lives in the Russian Empire! The brothers all settled close to one another in Wyoming, but eventually they migrated to very different parts of the United States, so I'm going to take a look at each of them. Isaac Sincher came to the United States in 1911 (as discussed here) and was living in Wyoming at least as early as 1918, when the newspaper announced his draft number. My grandmother's aunt and uncle, Abraham/Adolph and Amalia (Kassirer) Rutner, brought significant documentation with them to the United States from their time in Budapest; their son gave me copies a while back. Among the papers are documents showing that Amalia was very self-sufficient, applying for various business licenses in her own name. 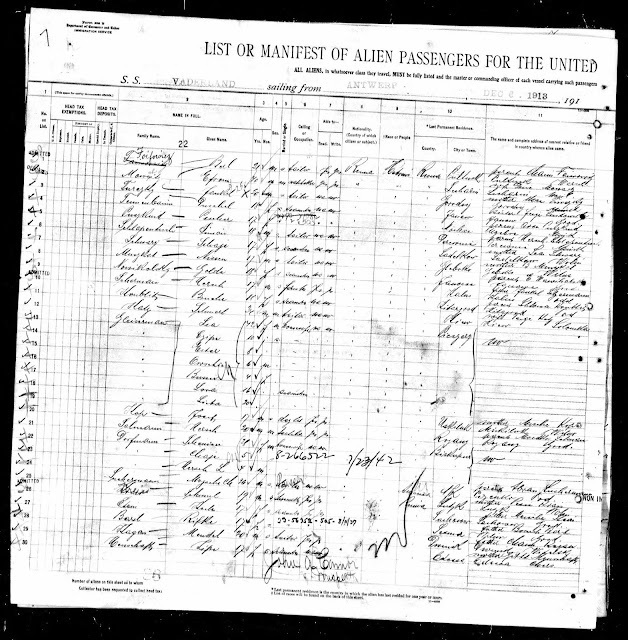 Initially I thought that this would have been after her husband left to America, but he did not leave until 1925, and these documents were from earlier that decade and the previous decade. 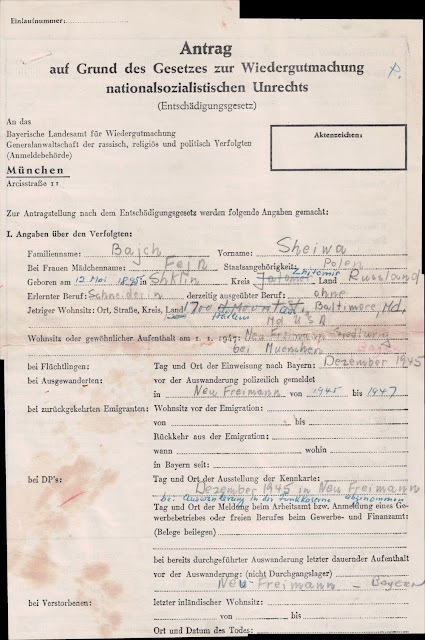 Just as my grandparents applied for reparations (giving some insight into their pre-war life and their life during WWII), so did my great grandmother, Sheva Fine Baitch who applied in 1950, just over a year before her death. In earlier posts, I discussed how in trying to discover the maiden name of Hinda Diamond, my great-great grandmother, I first discovered a document that had it as Christ--but I soon had a moment of epiphany and tied "Cousin Sam" mentioned in a letter written by my grandfather's first cousin to the Schmul Kreiss who emigrated to America with my grandfather's aunt and two cousins. Schmul became Samuel Krise in America and lived in Detroit where he had three daughters. I suspected that my great-great grandmother's maiden name had been Kreiss. In September, I received an email from a woman named Lisa, who had found my blog posts--and who was a great granddaughter of Sam Krise. And her grandmother is still alive. Well, channeling Israel Pickholtz, I realized this was the perfect situation for DNA testing! With my hypothesized relationship and the clues given in the aforementioned letter, Sam was likely a first or second cousin of my grandfather--definitely close enough for my father's, uncle's and probably my autosomal DNA to match. I wrote earlier about Kaufman Kaufman, one of my nieces' favorite "family tree stories." He was the brother of their 4th great grandmother, Amelia Kaufman Schwerin. The Kaufman family immigrated to Baltimore in 1853, and since my family all arrived in the 20th century, I've been fascinated with the research opportunities available for earlier immigrants. But could I trace the family further back to Europe? My sister-in-law's grandfather asked me if I could find out more information about his mother's mother. He knew that his mother, Cecelia Resnick Miliman, had lost her mother at a young age, possibly in childbirth. He wasn't sure of his grandmother's name or much else about her. He did know that his grandfather, Louis Resnick, had remarried a woman named Anna who helped to raise Cecelia. I was able to find Cecelia's birth certificate at the Maryland State Archives in Annapolis. Apparently she didn't have an official first name until she was in her 60s! 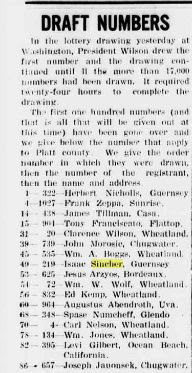 A few weeks ago, I'd found a branch of my Sanshuck family that came to the US, changed the family name to Sincher, and ended up in Denver as of 1922. While initially I'd found two brothers, I've now found four, all of whom lived in Wyoming in the 1910s. One brother, Morris (Meilach), came on the same boat as William/Velvel (and was pointed out by Susan Steeble on a comment to that prior post). 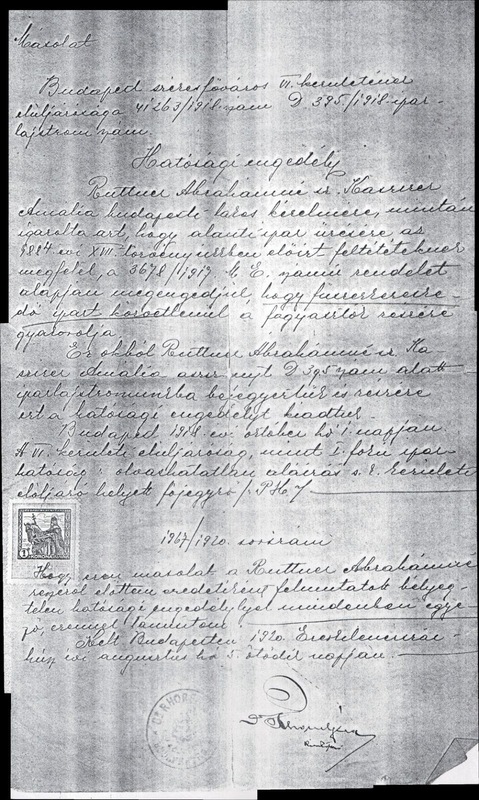 In his naturalization papers was the translation of a letter from his sister-in-law, Mindel. 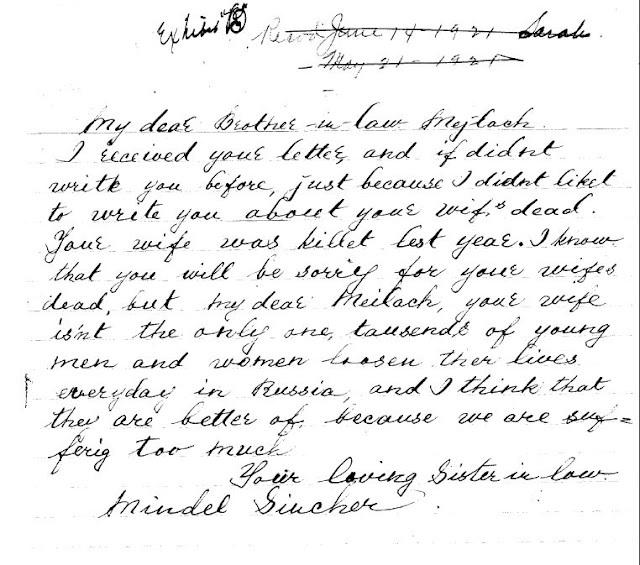 Morris was in America earning money to bring over his wife, so I can't imagine what it was like to receive this letter. 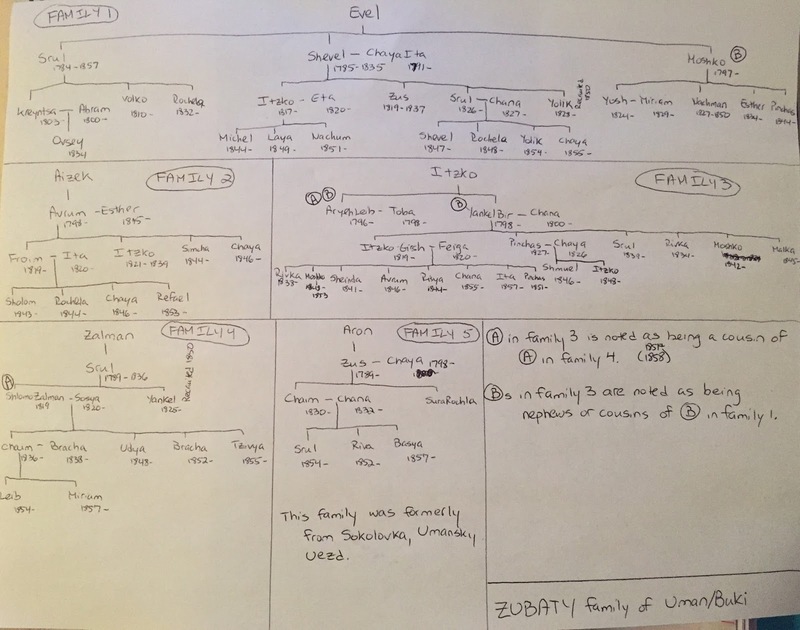 In multiple earlier posts, I've showed various revision lists with Zubaty families in Buki and Uman. 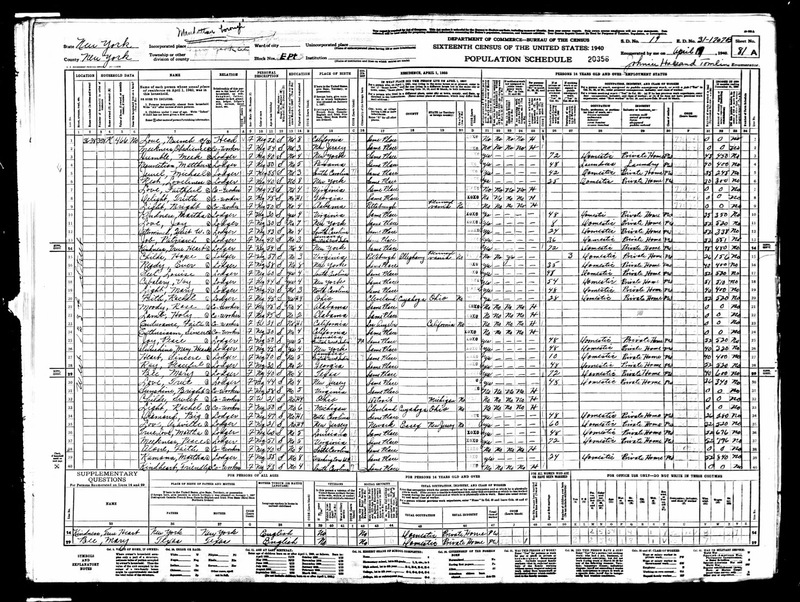 It seems like there are five distinct families here (likely all stemming from one couple 1-2 generations further back), with some of the notations on the census giving mention to connections between some of the families. The following is what I've extracted from these records. Information is from the revision lists of 1795, 1818, 1851 and 1858. This past weekend, I did an Ancestry search for some version of Sanshuck. I don't remember the exact search, but in the list of results was someone named "Purity Sincerity" in the 1940 census. Although I knew she(?) 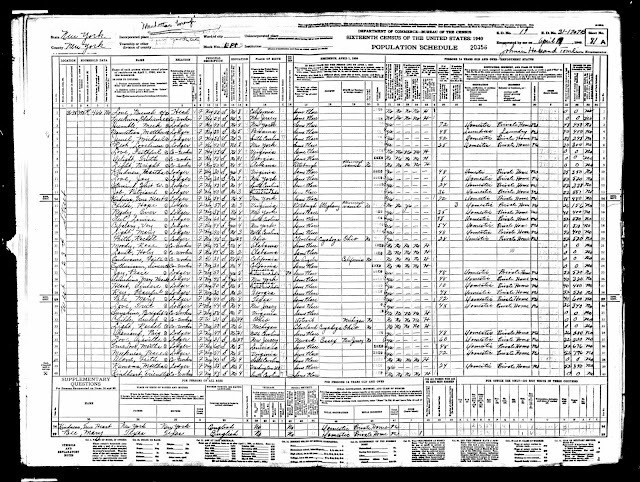 wasn't related to me, I looked at the census record anyways--and found the best census record I've ever seen. First of all, congratulations to my reader Vicki A. who won my giveaway for a free pass to RootsTech 2016! But if you didn't win, it's not too late to register--the current "promo pricing" is only $169 for this 3+ day jam-packed conference. Check below for a link to other Ambassadors' ongoing free pass giveaways! The conference Thursday keynotes have been announced, and I'm really looking forward to hearing these speakers. As mentioned earlier (here and here), the Hebrew Immigrant Aid Society (HIAS), along with the Zuriff and Turk relatives, helped to bring my grandparents and great grandmother to America. 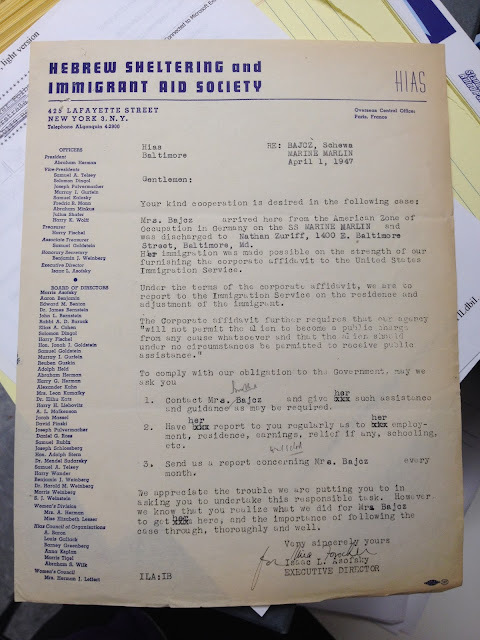 But even after April 1, 1947, when Sonia and Paul Diamond and Sheva Beitch arrived in New York, HIAS was still involved.